The state plans to suspend its largest wolf control program. The Upper Yukon Tanana area program, which has targeted wolves in an area of the eastern interior since 2004, is scheduled to cease after the 2017-2018 season. The State’s long running Upper Yukon Tanana wolf control effort is aimed at increasing Forty Mile caribou numbers for hunters by reducing the number of wolves on the caribou herd’s calving grounds, but Alaska Department of Fish and Game regional supervisor Darren Bruning said recent year’s field research indicates wolves are not the limiting factor. ”Potential signs of nutritional limitations were identified, including increased caribou birth rates and reduced calf weights,” Bruning said. A Fish and Game study published earlier this year said Forty Mile caribou grew from 13,000 in 1990 to over 50,000 at last count, but that the biggest growth was prior to wolf control. Since 2004, over a thousand Forty Mile area wolves have been shot from aircraft, under a state intensive management program that’s cost millions of dollars. Bruning stresses the program’s scientific value. ”The information gained through the research activities associated with intensive management are the most valuable product of the program,” Bruning said. The Forty Mile area wolf control program demonstrates the problem with manipulating a complicated natural system, according to retired wildlife biologist Fran Mauer of Fairbanks. Mauer, a critic of predator control, said the state may find itself working in the opposite direction. “If a herd is reaching carrying capacity, it’s imperative to be ready to reduce the number of animals on the land to prevent a precipitous collapse or crash,” Mauer said. Mauer, is frustrated that the state hasn’t already curtailed the Forty Mile area wolf kill. Hunting can be used to thin the herd, but Mauer, said it’s ironic that the state may also end up relying on wolves to reduce the caribou to a sustainable number. The Alaska Board of Game authorizes predator control based on Fish and Game recommendations. Board chairman Ted Spraker conceded wildlife management is not always a simple equation. Spraker said environmental factors, like climate change, further complicate the situation. The state plans research over the next five years to look at what happens to Forty Mile caribou after wolf control ends. Wolves killed in the state program have included animals based in the Yukon Charley Rivers National Preserve. 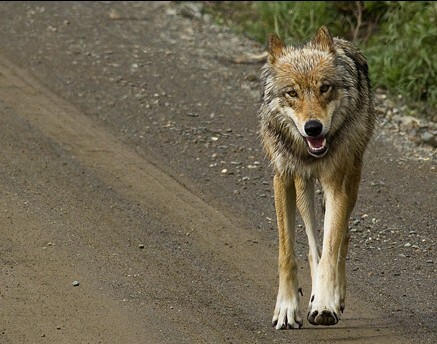 ”While predator control took place outside of the preserve, it did have an impact on the population and the makeup of wolf packs within Yukon Charley,” Spraker said. Preserve Superintendent Greg Dudgeon said some of the wolves lost were part of a long running NPS study, which was halted due to the state wolf kill. A recently published article on the Yukon Charley wolf study details impacts of state wolf control on wolves in the 2.7 million acre preserve. Dudgeon said Yukon Charley resumed wolf research this past winter, collaring seven animals to track.